How common are mast cell tumors in dogs? tend to have multiple tumors. What are the symptoms of mast cell tumors in dogs? nodules and can be misdiagnosed as lipoma. that resemble mast cells under the microscope are usually slow growing and not ulcerated, although the hair may be lost in the area. gastrointestinal ulceration (open sores). In this case, the dogs may experience vomiting, anorexia, dark feces and abdominal pain. progression of the disease. This system is by no means absolute and serves only as a guide. that can evaluate the extent of the disease in more detail and can aid the oncologist in planning an appropriate treatment strategy. tumors, pets will also experience pain associated with cancer treatments such as surgery, radiation therapy or chemotherapy. experiences pain, thus ensuring the pet's maximum comfort. 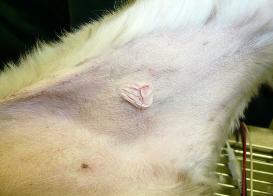 management options are available for your pet, please visit the Cancer Pain Management section. nausea and vomiting, and radiation therapy can cause mouth inflammation). provide maximum benefit and nutritional support for the patient. To learn more, please visit the Cancer Nutrition section. What are the treatment options for dogs with mast cell tumors? gastrointestinal ulceration associated with MCTs. healthy tissues, then additional treatments are necessary to prevent the tumor from growing back and spreading to distant sites. summarized in more detail in the next section. therapies as summarized in more detail in the next section. will excise a larger region around the tumor or the area can be subjected to radiation therapy, followed by chemotherapy. Source: Withrow Stephen J, and David M. Vail. Small Animal Clinical Oncology. St Louis: Saunders Elsevier, 2007. Palladia by Pfizer Animal Health and Masivet (Europe)/Kinavet (U.S.) by AB Science. multi-center, randomized, placebo-controlled clinical trial in 153 dogs with mast cell tumors that recurred (came back) after surgery. respectively); and more dogs progressed on placebo versus Palladia during the 6-week blinded phase of the study (66.7% vs.
research journal (London, Clin Cancer Res, 2009), and can be accessed by clicking on the link. Client information sheet about Palladia's safety and efficacy can be found here. cell tumors could not be removed by surgery, masitinib was better than placebo in delaying the time it took for the tumor to progress. weight, or pregnant or nursing female dogs. cancer condition, please visit the "Locate a veterinary oncologist" section. Are there any clinical trials investigating new treatments for mast cell tumors in dogs? 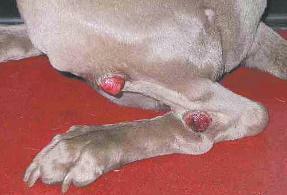 more about these trials, please visit the Clinical Trials for Mast Cell Tumors in Dogs section. What is the prognosis of mast cell tumors in dogs? corresponds to a highly aggressive tumor and most dogs die within 1 year after surgery as a result of local recurrence or metastasis. improve the pet's long-term prognosis. heparin, which can be very damaging to the body when released in excess by the tumor cells. spread first to regional lymph nodes and then mainly to the spleen and liver.